We've had some very nasty weather recently. Howling wind, torrential rain, power outage lasting days. It's enough to make you take to your bed, pull the covers over your head and not climb out until spring. You're so right, David - bring in those comfort food guns. Pasta - in any way, shape or form - is my weapon of choice. I could happily eat it five nights a week and it's the first item I look for on a menu. A complete stranger once confronted me in the supermarket while I was reading the ingredients in canned ravioli. You aren't going to feed that to anyone, are you? When my brother and I were young and home from school due to a snowstorm, our mother would give us Spaghetti O's for lunch. It was our "snow day" treat, a big bowl of O's with mini meatballs or hot dogs. If our neighborhood lost power, Dad would pile us into the car and off we'd go into town, to The Rosa Restaurant - electricity humming away - where, to my young eyes, the meatballs were as big as baseballs. Two years ago, when no one was all that excited about having a full-blown Christmas dinner, my father, brother and I convinced my mom to make her meatballs with spaghetti. The size and shape of a medium egg, fragrant with cumin and simmered in tomato sauce, her meatballs are THE best and we can't get enough of them. She finally gave in and oh, we were in heaven. Lately I've been sorting through and trying recipes clipped ages ago, and found several gems. A long day at the office? Refrigerator lookin' a little empty? This zippy sauce will soothe whatever ails you in no time flat. Heat oil, garlic, red pepper flakes, and capers in 12-inch skillet over medium heat, stirring frequently until fragrant and sizzling but not browned, 1 to 2 minutes. Add wine and bring to simmer; simmer until aroma bears no trace of alcohol, about 1 minute. Add tuna and salt and cook, stirring frequently, until tuna is heated through, about 1 minute. 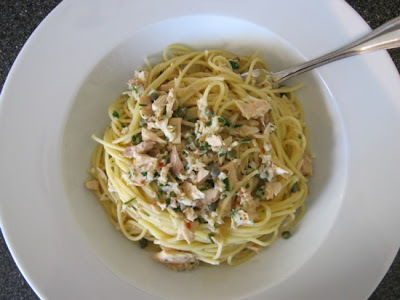 Toss tuna mixture, parsley, lemon zest, butter, cooked pasta, and reserved pasta water to coat in warm serving bowl. Adjust seasonings with salt and pepper to taste; serve immediately. Note: The recipe calls for 1 pound of penne or fusilli, but I found there wasn't enough sauce to adequately coat the pasta, especially if reheating the next day. 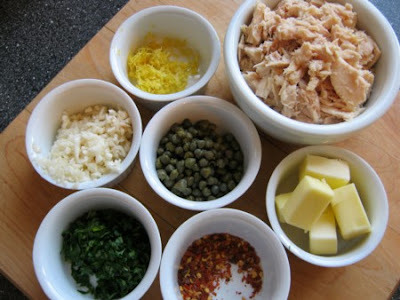 Excellent quick recipe, thanks for posting this.